Marley had a stroke at 1:30am, Sunday, July 24, 2005 and was immediately taken to a local Emergency Animal Hospital where she was placed on IV medications. She was released after 18 hours of treatment with some slight paralysis, however, at 11:30pm Marley suffered Cardiac Failure and gently passed on to the Rainbow Bridge while surrounded by her Scottie Family. In the seven months that Marley was cared for by Scottie Kingdom Rescue, she showed us the brave spirit and resiliency that a Scottie can have after being so terribly neglected. We’ll miss your sweet kisses and ever wagging tail. The above photo was taken by the shelter where Marley was taken after being found wandering the streets. In case you can't tell, Marley's head is to the left. You can barely make out one of her three remaining teeth. The shelter had to cut all of her hair off, just to determine which breed she was. 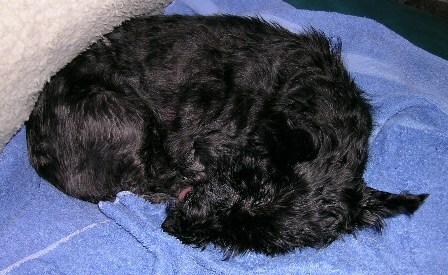 Marley's eyes were sealed shut with discharge from infection. Marley is nearing the end of her "grooming". Her nails had grown in complete circles. Needless to say, her skin was extremely irritated. Then they found a cyst on top of her right hip and four mammary tumors. We were told of Marley's predicament and rushed to Rescue her. She was immediately taken to our Veterinarian for a complete physical exam, blood tests and observation. 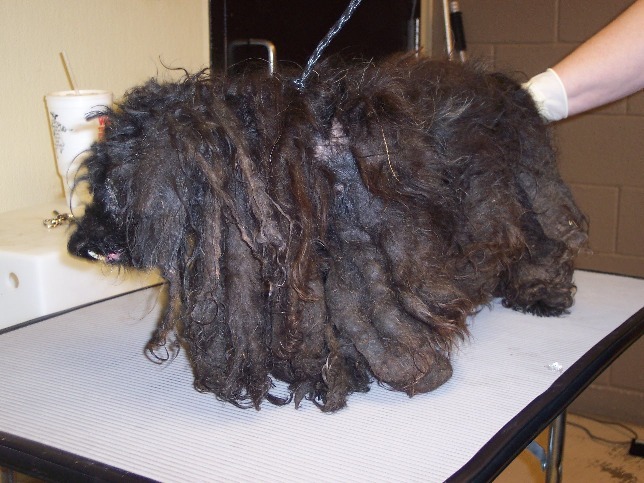 Marley required a medicated bath, heartworm testing, vaccinations, blood tests and surgery. Her three remaining teeth were severely infected and required removal. The four mammary tumors were removed and sent out for analysis, as was the cyst above her right hip. Marley remained at the Vet's for a total of five days before being released to us. Marley is sleeping comfortably at her foster home. No more painful toe nails, no more filthy "dreadlocks", no more infected teeth. Unfortunately, the mammary tumors were cancerous, but it is felt that the surgeons were able to excise all of the diseased tissue. Marley currently weighs a mere 14 pounds. She is blind in one eye but has partial sight in the other. Marley is mostly deaf. What is Next for Marley? We would like to find a loving home for Marley. A home where she can be cared for and loved. A home that Marley will feel safe in. A home where Marley can spend her final days, knowing that not every human is so uncaring. Are You the Person That Marley is Searching For? Will you be the family that Marley can rely on? Marley's medical costs have already exceeded $1,000.00. If you are able to assist us in defraying these costs, please click on the PayPal Donation button below. You may also send a Donation directly to us at the address listed. Thank you for helping Marley. Thank you for caring. Scottie Kingdom Rescue, Inc. is an Approved 501(c)(3) Non-Profit Organization. Your Contribution is a Tax-Deductible Donation to the extent allowed by law.